Can you explain to a newbie why VXX is down 1.05 today yet the April 20 calls are up .05? This is a great question and one which I receive in one form or another on a regular basis. Since we know from the question that VXX is down today (and down even more from the time the question was asked) this almost certainly makes implied volatility the culprit. 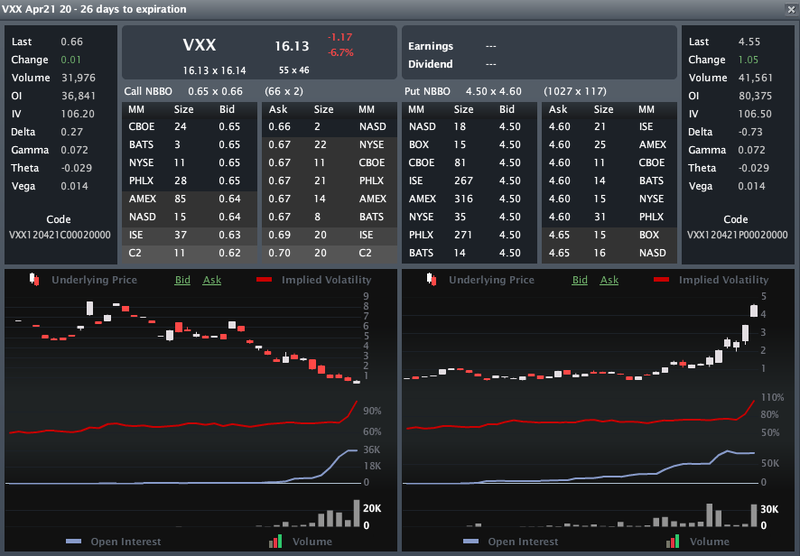 Rather than speculate, I pulled up the graphic below from LivevolPro which confirms that in the case of the VXX April 20 calls, implied volatility (IV), which is shown as a solid red line (VXX April 20 call on the left, April 20 put on the right), jumped from 84 on Friday to over 106 today. For some historical perspective, the IV had been stuck in the 70s for more than a month prior to Friday, at which point it increased from 75 to 84. This should serve as a reminder for those who are relatively new to options and are attracted to the possibility of making large amounts of money on directional trades that guessing the direction of the price move is not sufficient for making a profitable directional trade. In addition to getting the direction right, an options trader has to be cognizant of changes in implied volatility as well as the impact of time decay, aka theta. For those not familiar with the specifics of options pricing models, the Black-Scholes entry at Wikipedia is a good place to start.